Oh man, today started off rough! My brother and nephew had spent the night on trail with us and got up when I did. They were going to hike back out to the trailhead when we left at 7am. Bloodbath and Rampage had forgotten to set their alarm, so while I was waiting I thought I’d make sure I knew how to use the bear spray I got in my resupply yesterday. I intended to get it in the last town of Dubois before Yellowstone, but forgot to add it to the right resupply box. Anyway, I showed the bear spray to my brother since he lives in Montana and spends a lot of time outdoors and in the backcountry hunting and fishing. I removed the safety to practice in case I really need to use the bear spray one day. My brother took it from me and tried to put the safety back on. His son (my nephew) Brooks was standing there too. Somehow, the bear spray started spraying out of control. My brother tried to cover it with his hands and a big plume of fog shot into the air. Then he threw it in the bushes as it still continued to shoot out and yelled, “Run! Run!” Brooks and I ran about 20yds to the other side of the campground. Next to us were Bloodbath and Rampage who had their backs to us and didn’t know what was going on. They started coughing almost immediately as did I and felt the burn in my throat. Luckily, Brooks was unaffected and we all scurried as far as we could, which was about 50yds from the canister, before hitting the lake unable to get further. My brother John made it over and had his hands coated in the bear spray. It had stopped spraying when the canister emptied and the fog was slowly dissipating in the stagnant air. We were still getting pockets of it randomly in the air many minutes later and it took at least 15mins for it to mostly clear the 50yd radius. It all happened so fast and it took a few minutes to stop coughing and feeling the burn. Within a minute, John felt it burning his eye and he couldn’t open it. Then both eyes and it was intense. He was covered in it and had it on his face and in his hair. I guided him to the shallow cold morning lake where he had to take his shoes and shirt off and pour lake water in his eyes and over his head for 20mins. Each time he stopped, the burning started again. It was really hard to watch his suffer and not be able to help. I can’t even imagine what we would have done if we weren’t near a water source! After 20mins, his eyes improved to where he could open them and talk to us. They were really irritated and we waited to make sure he’d be okay to hike out. I said goodbye to my brother as stood in the lake with red irritated eyes. He handled it with a great sense of humor saying it will be a great story for the blog. Sheesh! I now don’t have bear spray and really don’t think I want any after that experience! For now, I’m not going to get any and I’ll see if that changes as I get near Glacier. 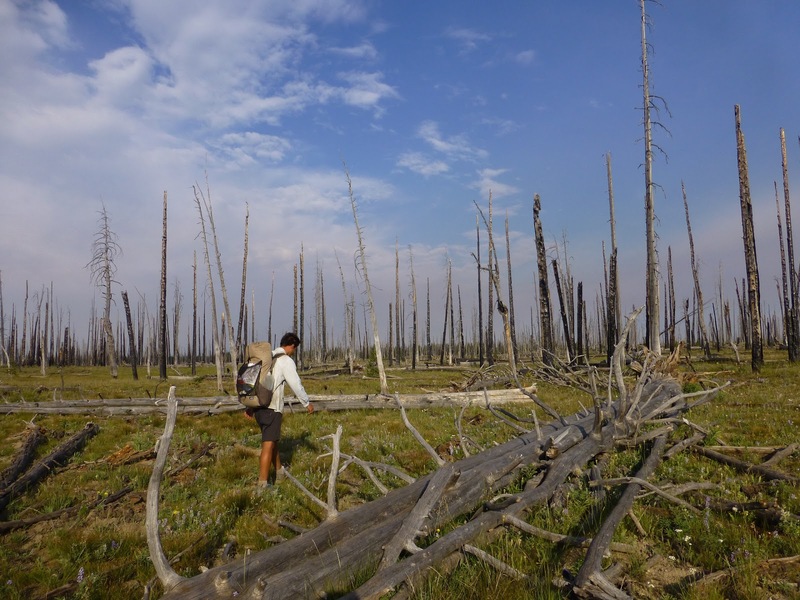 We started hiking at 7:40am with a late start and entered a burn area for the first few hours of the morning until we got out of the Yellowstone boundary. We saw two southbounders, Simon and Huck which makes our total 6 that we have either met or heard of. This is the point that we all start to overlap and there should be about 30 southbounders. I am looking forward to seeing my friends as there are a handful that I know heading towards us. There are many alternate routes and short cuts in this section though. We are taking the official route, which is the longest, so there may be some that we won’t meet if they take an alternate. 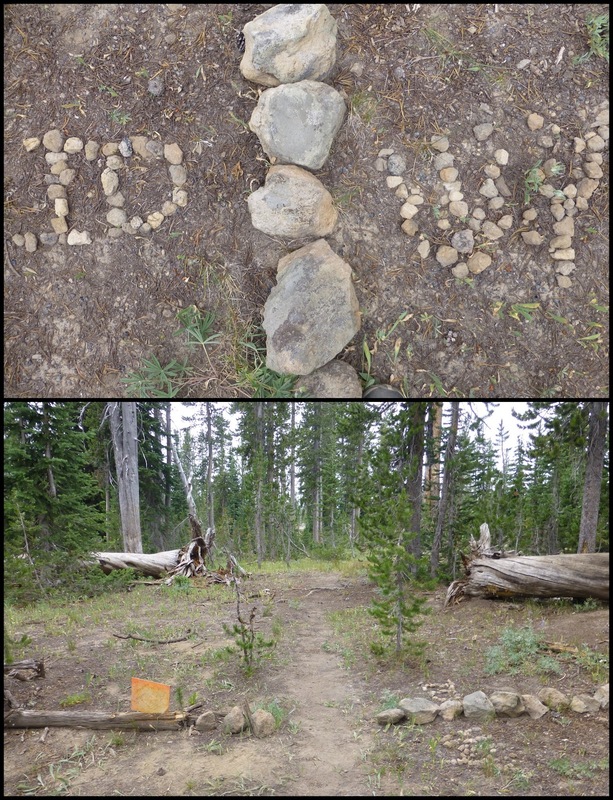 Anyway, Simon informed us that the sources from the lake we just left were DRY for the next 26mi! 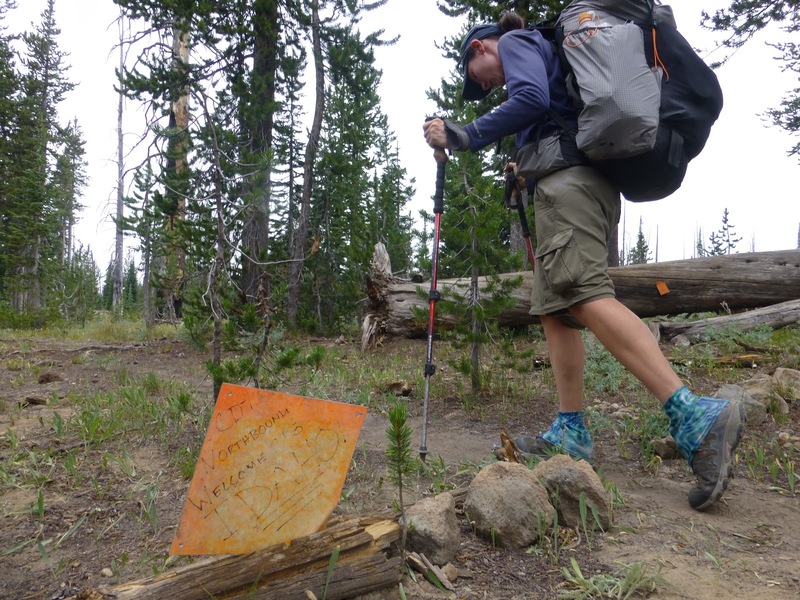 We had planned for one source to be dry as a precaution and had enough for 15mi. Thankfully, it was cool out and we had just started our day, so we could ration. It wouldn’t be fun, but it was doable. In addition to all this, I was rationing food as I forgot to buy lunch food for the next 5 days and would need to stretch my snacks. My brother gave me some of his extra food and that will get me through, but I’m still rationing. We had a long section through more burn and then a road walk pretty much the rest if the day…yep, we pretty much accepted that it would be a long day and that it pretty much sucked. The one bright spot in the morning was that we entered Idaho! That was a good boost! Things improved for me on the road walk when I got super speedy Internet (LTE) and was able to get my last 5 blog entries finally posted. I also got some phone calls and emails done. It was great! Problem was that it was overcast most of the day, so I couldn’t charge the phone and quickly ran the battery out when I thought there would be more sun to charge it. Dang! 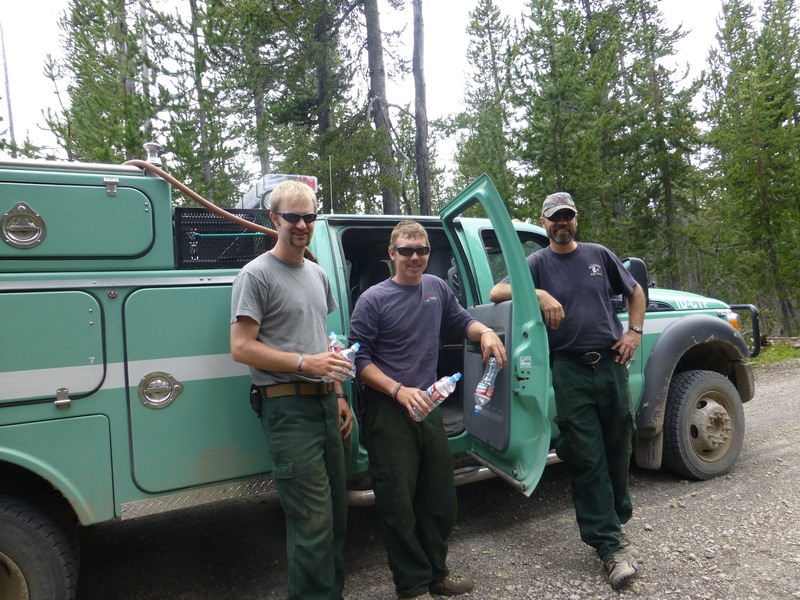 Then something wonderful happened…a forest service fire truck came down the closed dirt road we had been on for hours not drinking. They had a ton of water they have us! They said we pay taxes, so they are happy to give us water. Another great boost! We got so much that we didn’t even have to take the time to hike off trail to get water and were able to hike straight through to came. What a time saver! Towards the end of the day, we entered Montana. Three states in one day, yay! 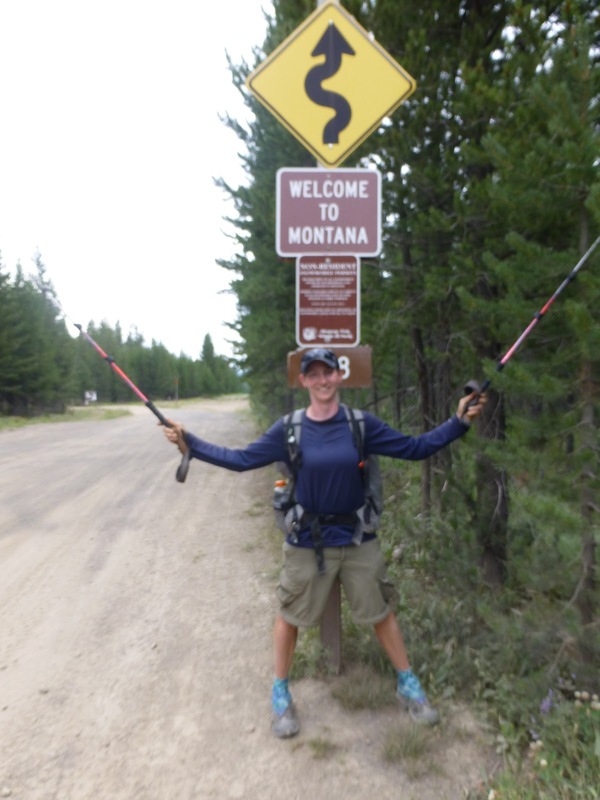 For awhile now, we will be hiking along the MT/ID border and repeatedly crossing back and forth from one state to the other. The last few miles were in the woods and they ended up being very dense. It was difficult to find camping and we are camped right next to each other in tall grass after moving some fallen logs and being creative with pitching. Given how the day started off, we ended up with great mileage, so we were glad that the day improved. It was a long day! Sadly, I had run my battery down on my phone, so I couldn’t blog and now have to do two tomorrow night. Argh.